This tutorial is included in GroundWiz Lite version. In this tutorial, we will explore how stretchUp parameter can be used for strata effect and also how useful map limits can be. Load tutorial file 'gwtut3_canyonScene.max'. To see the scene we will be working on, render any of 3 camera views. StretchUp, as the name suggests, controls how stretched each layer will appear in the Z (height) direction. This parameter affects primarily distribution and procedural bump of each layer. When the parameter is higher than 1.0, the layer will look more like a steep rock wall. On the other hand, values between 0.0 and 1.0 will create good strata effects. 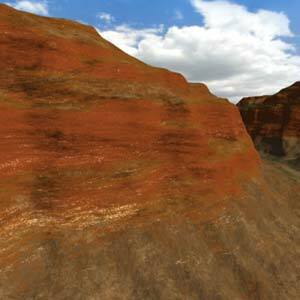 Layers in canyon case use stretchUp to create a strata effect. Default StretchUp value of 1.0 will apply no stretching. 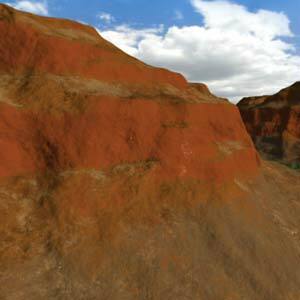 To see the difference, go to material editor and apply material in slot 2: 'Canyon StretchUp None' to mesh 'Terrain'. 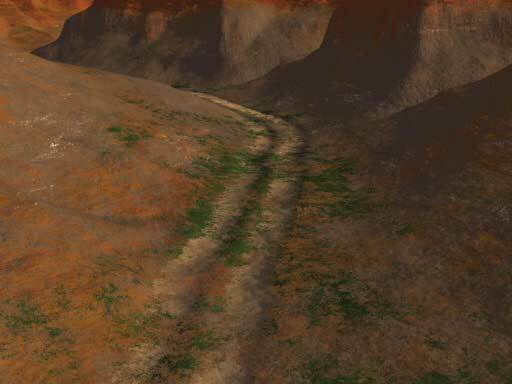 In this example, we will try to put a road in the valley. First go to material editor and apply material in slot #3: 'Canyon Road' to mesh 'Terrain'. Go to the material's GroundWiz and select layer 'Road' in the GW Layer Tree. Now go to Map Limits section for the current layer and click on 'Use' checkbox under Map Limits, and then the map button next to it. Pick Bitmap in the Map Browser list and then load image file 'roadMask.tga' from the same directory as the '.max' file. 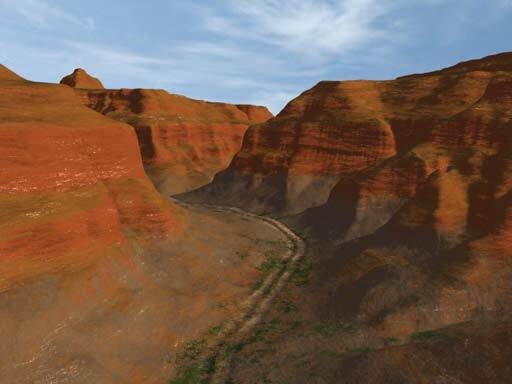 Note: Map used in Map Limits can be any standard 3ds Max map (Bitmap and Vertex Color are especially useful). It is important to know that white color represents zones where layer is visible while black color zones are invisible areas and shades of gray will be transition zones. And a good tip when using bitmaps as map limit… If you want transition zone to be bigger on your layer, either blur your image in some paint program or use Blur Offset in bitmap properties.